With the 20th and second last instalment of our Growth to Watch For 2018 series, we arrive in Toronto's Downtown Core, where some of the city's densest and tallest developments rise. Thousands of new residents and millions of square feet of new office space promise to make the heart of the city more vibrant in coming years, and today we'll take a look at these several projects in the pipeline or under construction, that will come together to make this a reality. This instalment covers the area bounded by Gerrard Street on the north, Victoria Street on the east, the rail corridor on the south, and Simcoe Street/University Avenue on the west. Our route will cover almost 40 projects on a path along the Yonge, Bay, and University corridors, before zigzagging south through the area. Continuing from where we ended off on McCaul Street, north of Dundas, we take Orders Street east to University Avenue. Here, a multi-year multi-phase renovation for Mount Sinai Hospital has been underway since 2008. The latest phase of work officially started construction in June 2017 following the closing of a $288.5 million contract. The project is targeting a Fall 2022 completion date. This phase of work includes the redevelopment of the Critical Care Unit, expansion and redesign of the Emergency Department, Operating Rooms and Surgical Services, an increase in Medical/Surgery Inpatient capacity, a redesign of Ambulatory Care areas, and the creation of a full-service, in-house Medical Devices Reprocessing Department. Across University Avenue one block to the south, we turn east onto Gerrard Street, and arrive at the southeast corner with Elizabeth Street, where KingSett Capital is expanding LuCliff Place (addressed to 700 Bay Street) with a 32-storey addition at this west end of the property. The Quadrangle-designed development will bring 274 new rental apartments to the area, as well as improvements to the sidewalk and public realm, and expanded retail on the ground floor. Demolition cleared the addition's footprint last year, and construction will proceed throughout 2018 and into next year. 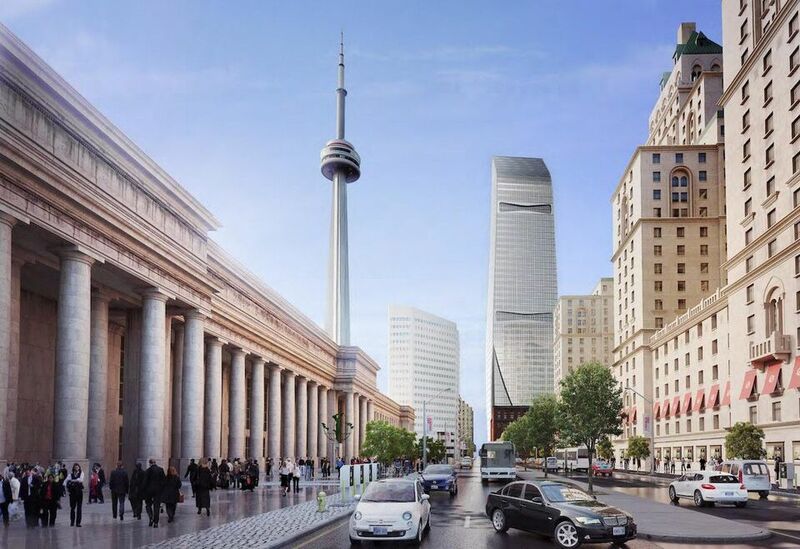 Rendering of 700 Bay Street, image courtesy of KingSett Capital. Continuing east, construction is wrapping up on The Livmore by Vertica Resident Services and GWL Realty Advisors. The IBI Group-designed luxury rental tower is now topped out at a height of 43 storeys at the southeast corner of Bay and Gerrard, and will soon add 594 new rental units to the area. Cladding installation is rapidly enclosing the tower's upper levels, and the first occupancies are scheduled to take place later this year. 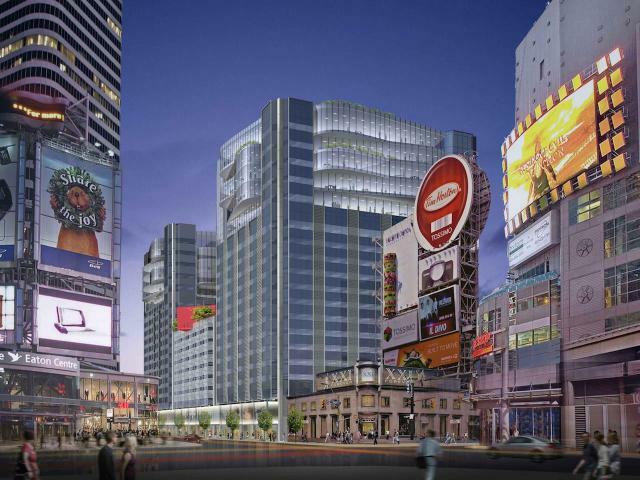 A handful of sky-scraping developments are proposed in the area surrounding the intersection of Yonge and Gerrard, which is set to become Downtown's next major height peak. Immediately adjacent to The Livmore, Great Eagle Holdings' proposed redevelopment of the Chelsea Eaton Hotel—dubbed Chelsea Green—would include three towers of 88, 88, and 49 storeys, designed by architectsAlliance. The residential and hotel development has been appealed to the OMB, and a full hearing is scheduled to take place this coming October. Rendering of Chelsea Green, image courtesy of Great Eagle Holdings. Directly south of Chelsea Green, another tall tower is proposed at 8 Elm Street by a subsidiary of The Pemberton Group. 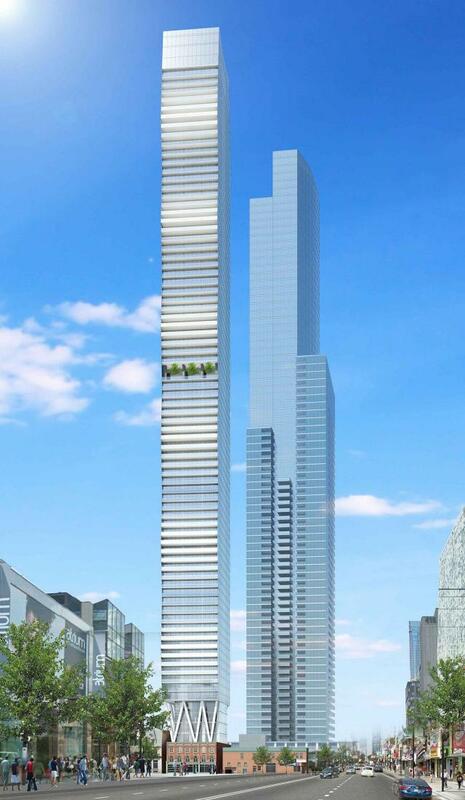 The 80-storey, IBI Group-designed residential tower met with resistance from City staff and local residents, leading to a rejection by City Council three months after the initial proposal. The plan was appealed to the OMB very early on in the process, and the project will be subject to an OMB prehearing and May, and a full hearing in October where it will be heard alongside the Chelsea Green proposal. Rendering of 8 Elm Street, image courtesy of 8 Elm Park Properties. On the southeast corner of Yonge and Gerrard, Cresford Developments unveiled plans for a supertall tower in early 2017 with 98-storey YSL Residences. Proposed to rise to a height of 343.9 metres (1,128 feet), it is designed by New York-based Kohn Pederson Fox Associates in partnership with architectsAlliance. The proposal was appealed to the OMB last year, though no hearings have yet been scheduled. Rendering of YSL Residences, image courtesy of Cresford Developments. Back on Gerrard and just east of Yonge, construction is well underway for the new Ryerson Centre for Urban Innovation at 44 Gerrard East. The project involves 3 and 5-storey additions to the existing 3-storey heritage building that fronts onto both Gerrard and the residential McGill Street to the north. The Moriyama & Teshima Architects-designed facility is scheduled to complete construction in late summer/early fall 2018. Following Victoria Street south, we continue through the Ryerson University campus to the northeast corner of Dundas and Victoria streets. Here, a three-storey building has been abandoned and boarded up since 2014, and is expected to be the subject of a redevelopment proposal. While nothing has been proposed so far, we will keep our eyes on this prominent intersection for future signs of movement. View of 38-40 Dundas Street East, image via Google Maps. Across the intersection is Yonge Dundas Square, where renovations are currently underway to add new illuminated signage to the popular public space. The added clutter is on track to be completed this year. Moving south on Victoria Street again, we pass HNR Properties' 2017-completed Velocity at the Square, before reaching Shuter Street and Massey Hall, where a comprehensive 7-year revitalization is underway at the heritage concert venue. 2017 was a big year for the KPMB Architects-designed project, with the completion of the expansion's underground component, and the announcement of a $5 million donation from the Slaight Family Foundation towards the project. Above-grade construction is scheduled to begin as the Hall closes this July, with a grand reopening targeted for September 2020. The added property for the Hall's south end expansion was donated by MOD Developments, as part of their adjacent development to the southwest, coming up next. 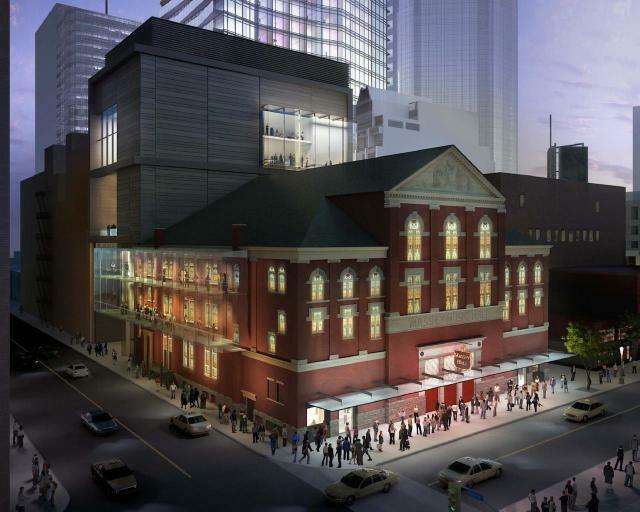 Rendering of Massey Hall, image courtesy of MH-RTH Corporation. Fronting onto Yonge Street south of Shuter, MOD Developments' Massey Tower Condos has been steadily ascending into the Downtown skyline throughout 2017, and the 60-storey, Hariri Pontarini Architects-designed condo will top out in the coming months. Upon completion, the curved and crimped project will bring 699 new residential units to the block north of Queen Subway station, with a restored heritage bank frontage to serve as the grand entrance. Across Yonge Street is the Toronto Eaton Centre, which has been undergoing plenty of changes in recent years. The latest news for the Cadillac Fairview-owned shopping centre came early this month with the announcement that BMO would be converting the floors above he Nordstrom store at the mall's north end into a 346,000 ft², four-storey 'urban campus' office capable of supporting up to 3,500 employees. No architect has been announced for the project which was previously home to Sears Canada's offices, though new details should emerge later this year. By the northwest corner of the Yonge and Dundas intersection is the Atrium on Bay, a shopping and office complex. Owners H&R REIT are looking to expand the complex with 5 and 6-storey IBI Group-designed additions to the existing 13 and 14-storey towers, along with a one-storey addition to the shorter mid-block volume. The Council-approved development was resubmitted for Site Plan Approval in November, and details have recently appeared outlining a new indoor entrance to the TTC's Dundas Station. An application for building permits from earlier this month hints at an imminent start for construction. Rendering of the Atrium on Bay expansion, image courtesy of H&R REIT. A bit further north on Yonge, a vacant plot of land at the southeast corner with Gould Street has remained undeveloped since the previous heritage building was lost to a suspicious 2011 fire. A 2013 proposal from the Lalani Group never got beyond the drawing board, and the site has been used as an urban market and food truck site in the years since. 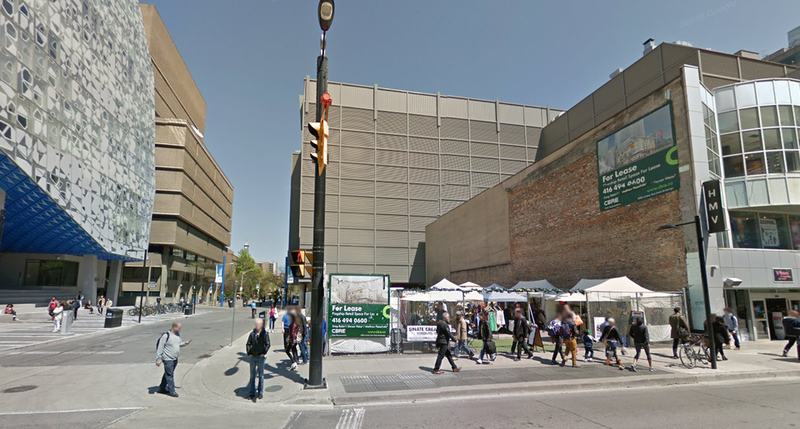 View of 335 Yonge Street, image via Google Maps. Backtracking several metres on Yonge, we turn west onto Edward Street. A now-empty lot at 20 Edward Street—formerly home to the World's Biggest Bookstore—will soon be redeveloped into Lifetime Developments' Panda Condominiums. The 30-storey, Turner Fleischer Architects-designed condominium tower was conditionally approved by the OMB, and resubmitted to the City late in 2017. Construction activity is set to begin this year. Rendering of Panda Condominiums, image courtesy of Lifetime Developments. Continuing west on Edward Street, we cross Bay Street and come to one of the few large remaining surface parking lots left in the Downtown Core at 70-100 Edward Street. This is where Conservatory Group is proposing to build Bay and Edward Condos, a pair of 19 and 22-storey condominium towers with 527 units by Richmond Architects. The plan has been appealed to the OMB, with appearances in 2016 and 2017, though no results from these hearings have been made available yet. Rendering of Bay and Edward Condos, image courtesy of the Conservatory Group. Passing the 70-100 Edward site, we divert north one block on Elizabeth Street, arriving at the site of the proposed Hospital For Sick Children Patient Support Centre at the northeast corner of Elizabeth and Elm. Plans for a 22-storey institutional building designed by Stantec and KPMB Architects were submitted to the City earlier this year, seeking an Official Plan Amendment (OPA) and rezoning to replace the existing eight-storey medical building currently occupying the site. We head west to University and turn south. On the block bounded by Edward, Centre, Dundas, and University, a plan by owner Davpart to build new residential levels atop retained heritage office buildings at 481 University Avenue was approved by City Council in 2014. The 55-storey, B+H Architects-designed plan hasn't advanced since being granted approval, though we'll be sure to return with updates if this plan goes forward. Rendering of 481 University Avenue, image courtesy of Davpart. On the west side of the street here, The Residences of 488 University Avenue by Amexon continues to turn heads with its ambitious structural engineering. The Core Architects-designed project is adding 37 new residential levels atop a structurally-reinforced 18-storey office building. 2017 saw the start of construction for the new residential levels above the re-clad office tower, work which will continue throughout the year. The 55-storey tower and its 453 new condo units are expected wrap up construction in 2019. We cross Dundas southbound and turn east on Armoury Street, arriving at the future site of the new Ontario Court of Justice Toronto. The design of the project by Renzo Piano Building Workshop—their first project in Canada—(Toronto-based NORR Architects and Engineers is Architect of Record) was revealed earlier this year following the close of a $956.4 million contract. Below-grade site preparation work for the project has been ongoing for some time, and the project's official construction start is expected in the coming months. Being overseen by Infrastructure Ontario, the project is aiming for a projected completion date in 2021. Across the street, we cut through Nathan Phillips Square and its recent Perkins + Will and Plant Architect-led revitalization. Kitty corner from the square at the southeast corner of Bay and Queen Streets, recladding work continues on Cadillac Fairview's Simpson Tower at 401 Bay. The Pellow Architects and WZMH Architects-led project is replacing the Modernist office tower's precast concrete aesthetic with a mix of glazing and spandrel, meant to provide improved building efficiency. While we've already taken a look at the north end of Cadillac Fairview's Toronto Eaton Centre, the south end of the mall also saw big changes in 2017. A pedestrian link spanning Queen Street was replaced by a new elevated bridge by Wilkinson Eyre, which opened in November, has become a popular selfie-taking spot in the months since it opened. At the intersection of Yonge and Queen—just south of where we earlier covered the Massey Tower—the Eaton Centre's 2 Queen West building on northwest corner is having its 1980s cladding removed to reveal heritage details that have been obscured for years. The plan from Zeidler Partnership Architects and ERA Architects includes a 3-storey glass addition up top with a 7,100 square foot green roof. An application for SPA was filed in November, and a Notice of Approval Conditions (NOAC) was issued this past January. We look forward to seeing the existing building restored to its original look. A block further east on Queen, the expansion of St. Michael's Hospital at the corner of Queen and Victoria Streets is nearing completion and on track to open this year. The 17-storey Patient Care Tower designed by NORR Architects and Diamond Schmitt Architects will add 250,000 square feet of new space to the hospital, and will be followed this year by a second phase consisting of a new emergency department at the southwest corner of Shuter and Bond streets. Turning south onto Victoria Street and continuing to Richmond Street, we reach the construction site of Great Gulf's Yonge & Rich Condominiums on the southeast corner. Crews are currently forming the massive underground parking garage for the 45-storey L-shaped tower designed by architectsAlliance. Construction is expected to rise above grade during the coming months, and work will continue into 2019. Upon completion, the building will introduce 669 new condo units and ground-level retail to the area. Turning west on Richmond Street, we cross Yonge Street and come to the site of the anticipated third phase North Tower of Brookfield's Bay Adelaide Centre. Zoning is approved for a 32-storey office tower located on the south side of Richmond, just west of Cloud Gardens. No new information regarding future tenants or construction is available yet, though with the local office market staying hot, and with work already having commenced in the now closed underground food court, we should hear news on Bay Adelaide North soon. We cross Bay. 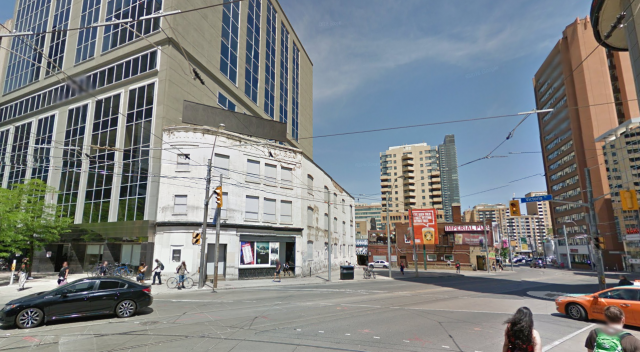 On the southwest corner at Sheppard, another building at Oxford Properties' Richmond Adelaide Centre complex is getting a makeover: a 2017 proposal seeks to modernize the early 20th century office building at 85 Richmond Street West. (The EY Tower was completed just to the south here last year.) The plan from WZMH Architects and +VG Architects • The Ventin Group Ltd will restore original exterior architectural elements while modernizing the office spaces within. The project was resubmitted for SPA earlier this year. In the southwest corner of the same complex at Adelaide and York, a recladding project is underway for the 26 and 33-storey office towers at 120 and 130 Adelaide Street West. 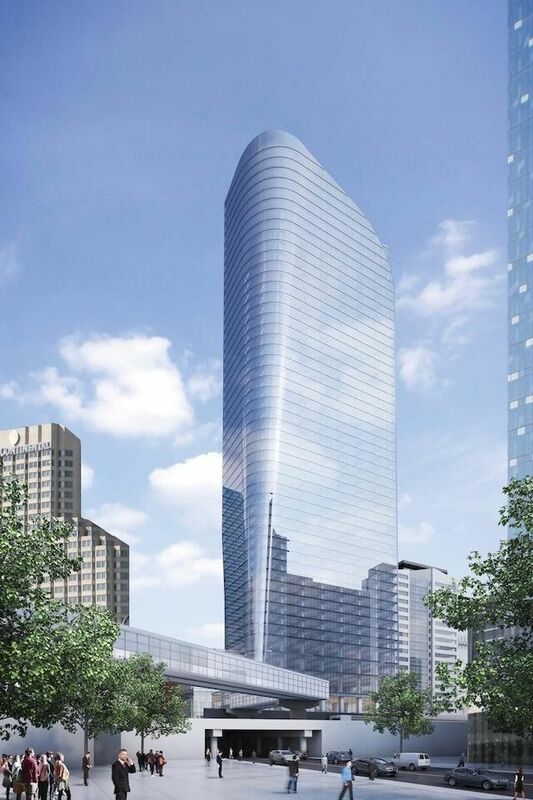 The WZMH Architects-led revitalization introduces a new glazed curtainwall system to the towers' exteriors, with a silver coloration to match the EY Tower, installation of which will continue over the next several months. 250 metres to the west on Adelaide, a 2016 proposal for 100 Simcoe from Sun Life calls for a 59-storey, Diamond Schmitt Architects-designed tower with 524 residential suites atop six levels of offices. The project was resubmitted to the City for rezoning in May 2017 with a number of minor revisions, though the proposed replacement of the heritage-listed building at its base could be a point of contention as planning progresses. 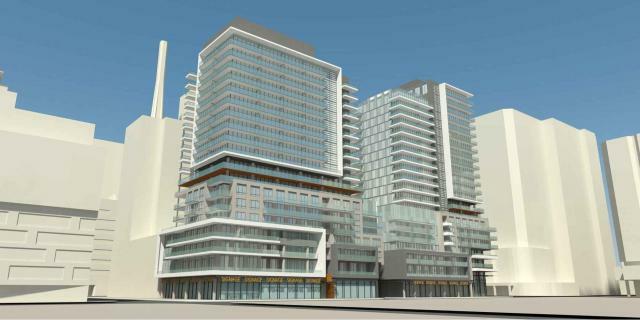 Preliminary massing for 100 Simcoe Street, image via submission to the City of Toronto. Heading south along Simcoe down to Front Street, a plot of land at the intersection's northeast corner is set to be redeveloped into a new office tower. 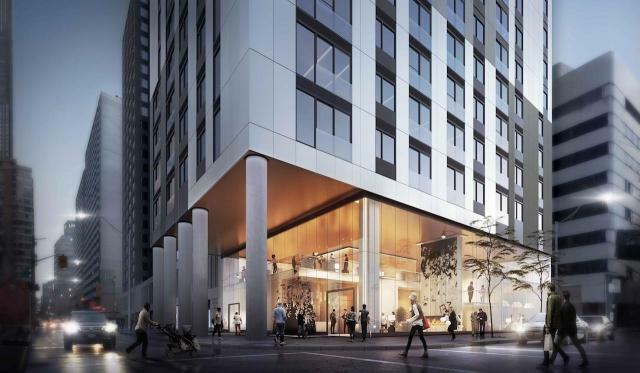 Cadillac Fairview's 160 Front West is set to rise 46 storeys to a height of 240 metres, featuring a design by AS + GG Architecture working with B+H Architects. The approved development was resubmitted to the City for SPA in February 2018, bringing the plans closer to reality. While no news of an anchor tenant has emerged yet, Cadillac Fairview is constructing a nearby tower—16 York Street—'on spec', confidence of the demand for office space. Could the same happen here? Rendering of 160 Front West, image courtesy of Cadillac Fairview. Across the street to the south, another office proposal is still in the works with Allied's Union Centre. 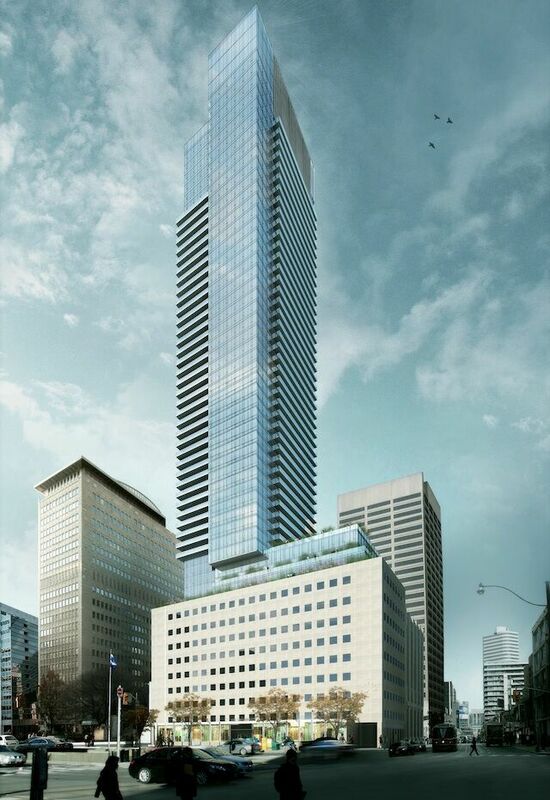 The 48-storey tower designed by Sweeny &Co Architects is proposed at the corner of Lower Simcoe and Station Streets. Much like its neighbour at 160 Front West, the Union Centre proposal has zoning approval and is also awaiting anchor tenants. At just over 238 metres in height, the tower's sculptural design would form a dialogue with the 160 Front office tower planned to the north. 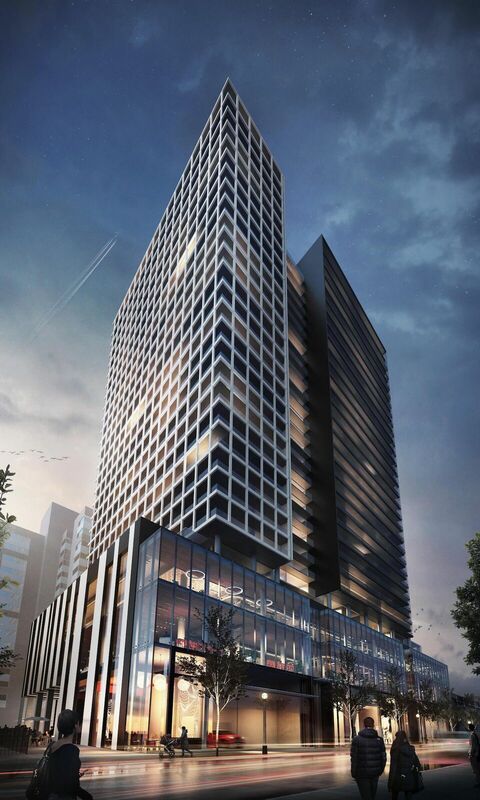 Rendering of Union Centre, image courtesy of Allied. Heading eastbound on Front Street, we reach Union Station, where a multi-phase revitalization project has been progressing incrementally for years. The project was originally scheduled to wrap up in 2015 at a price tag of $640 million, but has been pushed back again and again, now targeted to open late this year at a cost of over $800 million. Restoration of the station's main building continues, overseen by NORR Architects and EVOQ Architecture, including restoration work on the Great Hall and a total rebuilding and expansion of the GO Bay Concourse area. Work on the Front and Bay moat covers is well underway, while retail spaces—overseen by Osmington and designed by Dialog Architects and PARTISANS—continues below the VIA Concourse and GO York Concourse. Immediately east of Union Station, the Dominion Public Building at 1 Front Street East is another site destined to support a high-rise development. The block-long building—designated on the Ontario Heritage Inventory—was sold by the Government of Canada last year. News of the building's purchase by Vancouver-based Larco Investments broke in early 2017. Our Forum thread includes concept renderings created during the land sales process to show what could be possible for the site, but they do not represent Larco's plans. City staff have met with Larco to discuss the plans, and we look forward to learning further details once an application is submitted. Turning north on Yonge Street, we quickly turn west on Wellington. Most of the north side of Wellington as far as Bay—mid-rise limestone-faced buildings known as Commerce Court East and Commerce Court South, are proposed to be replaced with Commerce Court 3, a 64-storey office tower of over 1.9 million square feet designed by DIALOG and Hariri Pontarini Architects for the Quadreal Property Group. 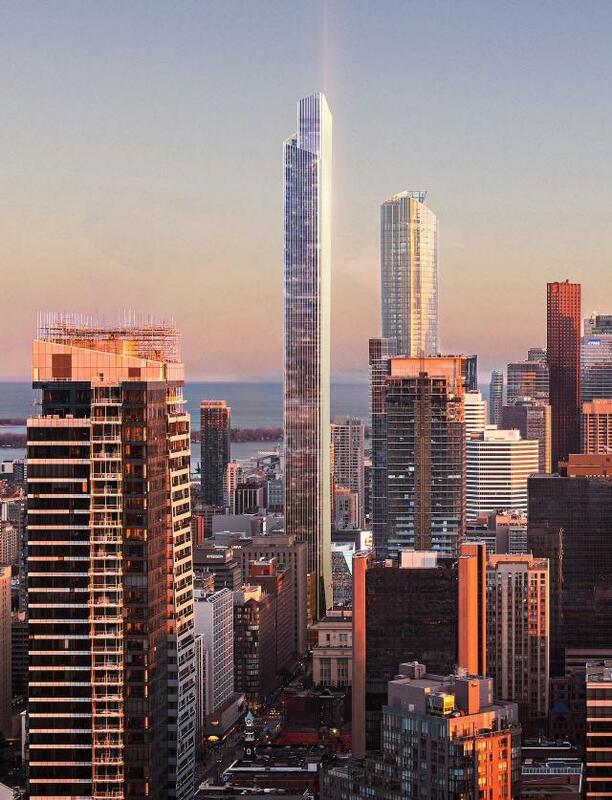 The building is proposed to rise 298 metres—the exact same height as First Canadian Place. A glass pavilion with retail and restaurants would be built along Wellington, designed to bring more light and life to one of the quieter streets in Downtown Toronto. The proposal for rezoning was submitted to the City in December 2017, and has been seen once by Toronto's Design Review panel. We now turn south on Bay Street, and head towards the lake and our next instalment. 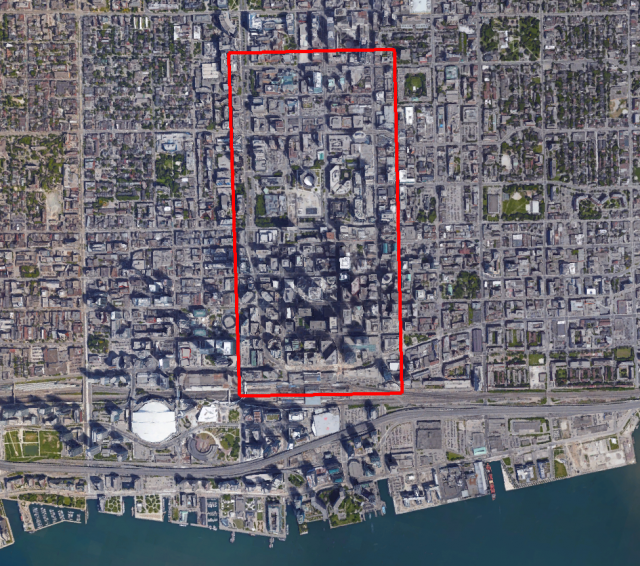 Next up, our final Growth to Watch For story of 2018 heads south from here, across the rail corridor to explore all of the development happening on Toronto's Central Waterfront. In the meantime, make sure to check out the database files and associated Forum threads for each of the projects mentioned above for more information. You can tell us what you think of all the developments happening in the city by joining the discussions in the threads, or by leaving a comment in the space provided on this page! 80-storey condominium tower at 8 Elm Street, in Downtown Toronto. 469 Suites with 0 parking spaces. Developed by 8 Elm Park Properties Inc, designed by IBI Group. Recladding of B+H Architects' 401 Bay Street in Toronto by Pellow/WZMH Architects for Cadillac Fairview. Renovation and addition for Oxford's 85 Richmond Street West with WZMH Architects and heritage specialist +VG Architects, part of the Richmond Adelaide Centre in Toronto's Financial District.